On April 27 the next Interfaith dinner will be held at First Baptist Church. The topic will be humility. Humility is a respected and highly-regarded concept in probably every faith-based system, yet humility eludes most of us. This doesn’t mean that we are bad people; it just means it is difficult for us to approach a situation in which we are not the center. I wanted to offer a few of my own thoughts on humility and encourage you to register for the dinner and participate in the discussion. Send me an email and I will send you the registration link. The dictionary defines humility as “a modest or low view of one's own importance; humbleness.” It’s a willingness to decenter yourself, to encourage yourself not to focus on your own benefits or losses in a situation but rather accept that the other person has their own ideas and the right to self-determination. All you can do is offer suggestions without judgment or expectations. This means not getting angry or flustered or hurt if someone doesn’t do what you would like or take your advice, and yet still care for them at the same time. This is hard to do. When friends are in a difficult situation, we often say, “This is what I would do but it’s your life. Do what you want.” We don’t always seem to mean it. We get offended or hurt because we feel that if the person would simply follow our advice, they would be out of the situation that they’re in. In short, we are focusing on ourselves and our own feelings rather than the other person. We are determining whether not we will continue to care about that person based on how we feel about their ideas or their decisions. It’s as if we take their lack of adherence to our advice as a personal rejection. It’s even harder when people have opinions that are really unappetizing, that are negative towards a segment of our population. It’s easier to dehumanize the person than to understand that these hateful ideas are but one aspect of that human. As I said earlier, this is hard to do. It’s a process that takes a lot of self-awareness and self-reflection. You have to be willing to be honest with yourself in a kind way. You have to be willing to let go of your ego. It’s something I have been trying to learn to do over many years. I like Buddhist teachings because this is a central premise in Buddhist thought. But my study was never practical. We studied the power structures of discourse in graduate school as it applies to literature and social processes, but never from the perspective of humility. I really started to consider the concept of humility after I took a community health worker course. One of the main tenets of the community health worker role is to understand the concept of cultural humility. A community health worker is not a health professional or a social worker, but rather someone who is an advocate and a resource for those in the community who need help, working from a holistic definition of health. The idea is that as we are working with clients who are looking for help, we aren’t there to force them to do anything or give them ultimatums, but rather offer help and suggestions and empower them to make decisions, and to still be there as a trusted, caring resource, regardless. It also requires that I not impose my cultural background on the client, that I let the client tell the story from their own understanding and work with them from that point of departure. So you may be asking, what does this mean on our campus? I can only speak for myself. I have been a student and I have a faculty member. As a student I had great faculty members who understood this but many who did not. As a faculty member, this has helped me be cognizant of the power dynamic between instructor-student. It has helped me remember that each student is an individual, a complex person with issues and a background that I don’t see in the 150 minutes I have them in class each week. This has helped me bear in mind that I cannot make an assumption about my students. I can’t assume why they do or don’t do anything. All I can do is say this is what you’re supposed to do and if you are having trouble, how can I help you? What do we have on our campus that could help you with whatever issue you have? Sometimes there is a possibility of help. We have tutorial services if you need extra peer-instruction; we have counseling services if you’re going through a rough patch in your private life; we have financial aid counselors who can help you investigate your options. But sometimes there is nothing I can do. That is the hardest part. Sometimes what the student needs is way beyond what I or the University can offer. Sometimes all I can do is sit down with a student and let them know I hear them, that I am listening and that I see them as a fully self-empowered person and try to connect them to resources that can provide what they need. And I have to try to do all of this without judging them or their choices or whatever the case may be. In the end we are here to teach content from our expertise and to serve in as much as the student will let us. All we can do is sincerely offer without expectations; it’s up to them to make decisions about what steps to take. I try to keep this same perspective in my professional and personal relationships, but am not always successful. I see so often that discussions often diverge from what the issue is to individual agendas, to power plays that eclipse the issue because the self takes precedence over the task at hand. Barriers emerge that prohibit resolution or positive solutions. “How does this benefit me?” becomes the question rather than “How does this address the issue?” Negotiation is impossible when what I want takes center stage and becomes the goal rather than a true dialogue that allows us to seek out a viable solution that is mutually beneficial and really addresses the task at hand. Can I say again that this is hard to do? It’s having the grace to forgive others whom we feel have offended us, to not connect our emotions or feelings of self-worth to their actions, to not simply react. It is also having an understanding that not everyone does this. It is complicated and it is messy. It is not easy and it is not perfect. We are all imperfect humans trying to do the best we can. We aren’t always successful but through empathy and understanding, we can keep moving forward. So I challenge you as I challenge myself every day to think about this as you interact with those around you. If you feel yourself reacting to someone, take a step back and look them in the eye. See them as a separate individual. Listen to what they’re saying, coming from a place of understanding them on their terms. Seeing someone as human doesn’t mean you have to like or agree with their actions or thoughts. It also doesn’t mean you have to be close friends or hang out with them. It simply means you see them as a human. Talk to them as a fellow human. 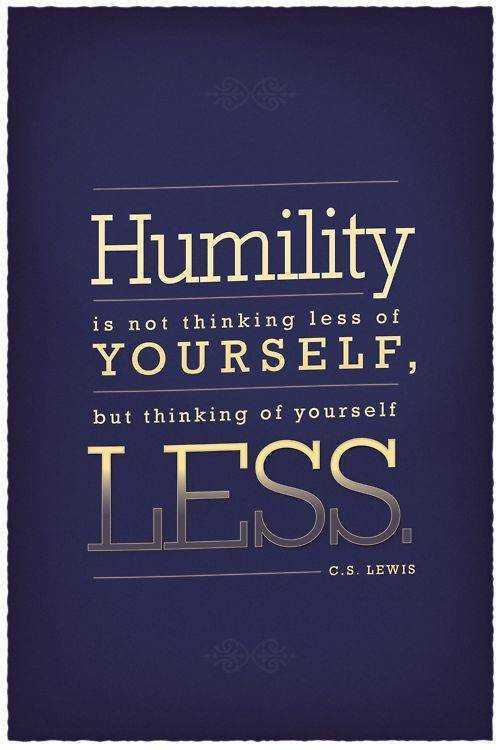 Humility is a great tool to possess as we move through this imperfect, human world.